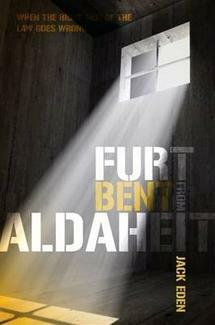 Amongst the seven novels longlisted for the 2012 Ngaio Marsh Award for Best Crime Novel is the delightfully entitled FURT BENT FROM ALDAHEIT by Jack Eden (Pear Jam Books). This debut thriller from local writer Jack Eden was apparently inspired by the actions of some police officers during the Crewe murder inquiry and subsequent campaign to free Arthur Alan Thomas. A young Kiwi shaped by delinquency and imprisonment in Australia finds himself trying to unpick the cause célèbre conviction made by his childhood tormenter, an overly determined cop. Furt Bent from Aldaheit is packed with intriguing characters, and nicely mixes moments of darkness and humour as it hums along... would entertain and delight many readers. Now, thanks to the excellent US-based crime fiction blog/website, The Rap Sheet, we can all find out a little more about Jack Eden (aka Geoff Vause) and what went into writing this intriguing and slightly unusual crime novel. The Rap Sheet editor Jeff Pierce has published a large "Story Behind the Story" feature by Eden/Vause on the writing of FURT BENT FROM ALDAHEIT. After a long career producing and editing daily and community newspapers, Vause served as private secretary to New Zealand Civil Defence Minister John Carter, and then as editor of education publications. He is now a sub editor for a large media company. Vause on writing crime: "I allow the characters to drive the tale through the settings and events. In short, the crime genre usually has the crime(s) central to the idea, and the characters react to the crime and take their shape largely in response to it. Solving the crime is almost irrelevant to me. In my fiction I am looking for solutions, resolution, perhaps redemption, in the character interaction." The piece on The Rap Sheet has a lot more very interesting things in it (the above is the briefest of tastes). I recommend you click here and read the full article. In an excellent piece of news near the end, Vause/Eden shares that he is working on a sequel to FURT BENT (working title: BODY COPY), which retains the Australasian setting and begins with a woman's body discovered in a church. I look forward to reading it. For international readers, FURT BENT FROM ALDAHEIT is available on Amazon Kindle for just $2.99. A bargain. It's definitely worth a read, especially at that price - so take advantage (not all New Zealand crime fiction is widely available internationally).